In the early 2000s, not long after I moved to southern Arizona, someone turned me on to a delicious drink we call “chlorella lemonade.” That person undoubtedly was my father, Dr. Hank Liers. 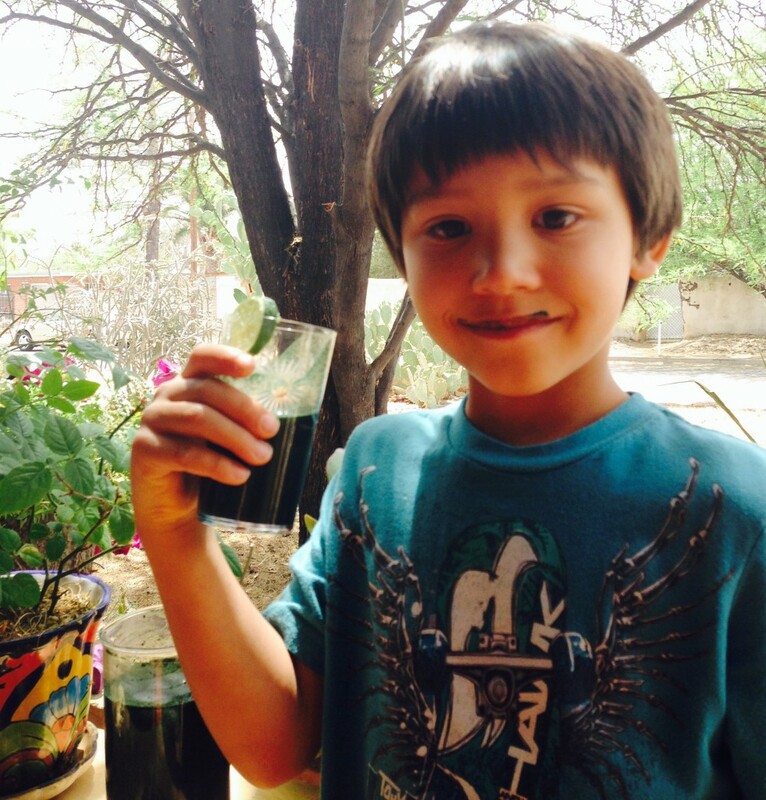 At the time, he was into putting chlorella into different foods and drinks with an eye toward improving nutritional value. He still tinkers that way. In any event, that’s how I became enamored with chlorella lemonade. I’ve drunk it for more than a decade. Fresh lemonade itself is a great thirst-quenching drink. Adding chlorella to lemonade improves its nutritional profile, adds significant detoxifying and healing characteristics, and makes it essentially a hydrating, alkalizing “green” drink. All without sacrificing taste. That is to say, it won’t be a deal breaker (for most people) when it comes to flavor, or texture for that matter. While taste is a matter of opinion, the health-building characteristics of chlorella are indisputable. That doesn’t mean I never make straight-up lemonade. But I’m far more desirous of creating fresh, custom lemonade drinks using superfoods, including chlorella. Indeed, one of my favorite drinks is a great-tasting chlorella lemonade made with fresh-squeezed organic lemons, organic grade B maple syrup, chlorella (1–3 teaspoons), and perhaps a pinch of cayenne. That’s a great basic recipe. Over the years, we’ve created different versions of the basic recipe. Some ingredients include fresh limes, fresh hot peppers (including habanero and chiletepin peppers, blackstrap molasses, chia seeds, and chlorella, of course. In fact, when I think of all the different versions of lemonade we’ve created, the single ingredient that sticks in my mind is chlorella. I simply love chlorella lemonade. It even tastes great to me without any maple syrup or cayenne pepper. Especially on hot summer days. 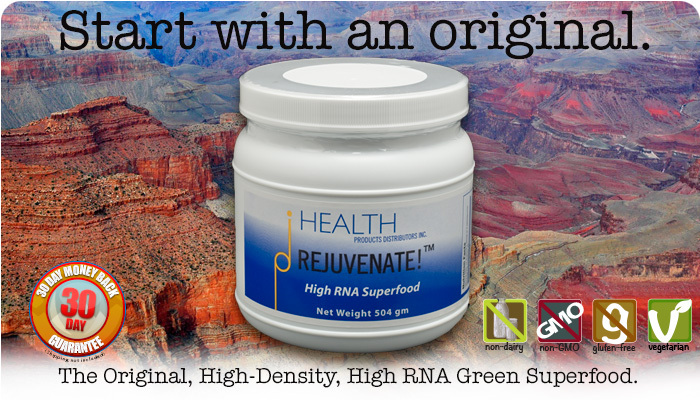 About seven years ago (in 2007), HPDI launched its first Rejuvenate!™ high-RNA superfood (original greens). You might call it a “chlorella-based” superfood since it’s about 40% chlorella. But it’s got a lot more than chlorella going for it. I’ll talk more about that later. I had sample versions of Rejuvenate!™ superfood in 2006. I was taste-testing it and experimenting with various drink and smoothie recipes. One day, I ran out of my supply of chlorella just as I was planning to make a batch of chlorella lemonade. Having no chlorella available, I reached for the new Rejuvenate! formula as the best alternative I could find. To my surprise, it tasted just as good. Maybe better!! Now I make Rejuvenate! Lemonade on a regular basis. I make it year-round, but I tend to drink more of it in the spring and summer months. It provides high-level hydration and quenches thirst supremely well. Because Rejuvenate! is so rich in dietary nucleic acids (i.e., the richest source per unit weight among our three Rejuvenate! superfoods), I find it easier to reach my daily goals for RNA intake. That is, I aim for at least 340 mg of dietary RNA daily, but I prefer to consume 1,000–1,500 mg. Just three scoops of original Rejuvenate! puts me over 1,000 mg. I may drink two quarts of Rejuvenate! lemonade (each with 2–3 scoops of Rejuvenate! ), so I can easily meet my optimal daily intake. I drink Rejuvenate! Lemonade frequently. But about once or twice per year (usually in the warmer months), I will drink it exclusively for one to weeks. That is, I will flush (or fast) using Rejuvenate! Lemonade alone. I greatly enjoy my Rejuvenate! lemonade flushes!! In fact, I look forward to them. I will talk more about lemonade flushes or diets later. The Rejuvenate! Lemonade recipe is delicious and amazingly nutritious. After you taste it, you may wish to consume it frequently!! As we say, it is delicious, satisfying, and detoxifying! Fill the jar with purified water. Add all ingredients, i.e., lemon juice, maple syrup (grade B), Rejuvenate!™ original, cayenne pepper (optional) and ice (optional). The order in which you add ingredients doesn’t matter so much, but fill the jar with water first to prevent Rejuvenate! from sticking to the jar. We then prefer to add the lemon juice and maple syrup before adding the Rejuvenate! because it helps make measuring easier. Shake or stir well. Enjoy!! I typically use a one-quart mason jar. That way I can easily put the lid on the jar and shake to mix. But any quart-sized or greater jar or pitcher will work, as long as you shake or stir well. The ingredients go into suspension reasonably well, but there may be some settling. Consider re-stirring if it sits for a while. A straw or long spoon works nicely for this purpose. Even kids love Rejuvenate! Lemonade. This means it’s a great way for them to get concentrated nutrition that supports good health, proper growth, and ensures intake of nutritious greens!! Rejuvenate! Lemonade is satisfying & cooling on warm days in spring and summer. Over the years, our recipes and therapeutic uses of lemonade have been informed and inspired by Stanley Burroughs’ The Master Cleanser and similar proven resources. Regular lemonade (e.g., our recipe minus Rejuvenate!™) actually exerts potent healing properties well beyond hydration. It can be the basis for an effective kidney cleanse or flush, especially when used in combination with certain kidney herbs (e.g., tinctures and teas), superfoods, and a complete program of juicing. That will be the subject of a forthcoming article on the HPDI blog (so look for it!!). In The Master Cleanser, Burroughs recommends consuming regular homemade lemonade for at least 10 days and up to 40 days. If you’re interested, you should definitely check out his work because there are many considerations to take into account when doing a lemonade diet. As noted, these are somewhat different from those I might suggest for a complete kidney cleanse. But they are worth contemplating if you’re going on a lemonade diet. Adding Rejuvenate! to lemonade boosts its therapeutic value both for every day use (e.g., to optimize intake of dietary RNA) and for therapeutic purposes like kidney cleaning. That doesn’t mean a program for cleansing kidneys (or a Master Cleanser type lemonade diet) necessarily includes Rejuvenate! superfood in every glass of lemonade. However, Rejuvenate! strongly supports detoxification which is useful when cleansing and purifying the body. Just as with a regular lemonade diet, you can drink 2–4 quarts of Rejuvenate! Lemonade daily as a rejuvenating, cleansing diet for a period of 1–3 weeks. I usually do a “Rejuvenate! Lemonade Diet” twice yearly for about two weeks. I will drink 2–3 quarts daily depending on my level of hunger. That is about 8–12 glasses (8 ounce) per day. Beyond that I will mostly only consume water (as per Burroughs). However, I will sometimes add an extra scoop of Rejuvenate! to my lemonade recipe. And occasionally I drink four quarts of Rejuvenate! Lemonade in one day. The keys are flexibility, listening to your body, doing what you feel comfortable with, and what feels right to you. Fresh-squeezed lemonade and “chlorella lemonade” provide significant levels of nutrients for good health. Rejuvenate! Lemonade provides even greater nutritional power. 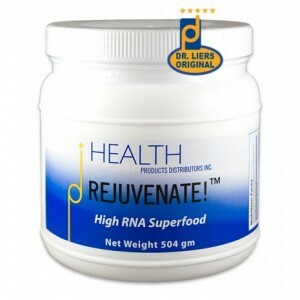 That’s because Rejuvenate!™ high-RNA superfood was formulated by Dr. Hank Liers not only to provide therapeutic levels of dietary nucleic acids, but also to include nutrients supporting the metabolic pathways that allow the body to uptake, assimilate, and utilize dietary RNA. Nutrients such as D-ribose, magnesium, folate, and vitamin B12 are all known to support the body’s use of dietary nucleic acids (i.e., RNA, DNA, nucleotides, and nucleosides). For example, D-ribose is actually the rate-limiting natural sugar (backbone) for the uptake of dietary RNA. That means if your body’s has a good supply of D-ribose, then it will use it to better assimilate dietary nucleic acids. I include the Ingredients List and Nutrition Facts Table for Rejuvenate!™ superfood at the bottom of this article. You can also find these tables on the Rejuvenate!™ product page. You’ll notice Rejuvenate! superfood also provides other nutrients like spirulina (blue-green algae), natural seaweeds (good source of natural iodine and other minerals), rice bran solubles (source of antioxidants like tocotrienols), and chia seeds (source of essential fats, fiber, and other nutrients). Beyond chlorella, Rejuvenate! superfood includes other high-density sources of dietary nucleic acids like Chlorella Growth Factor (CGF) (nucleic-acid rich extract from chlorella), nutritional yeast, and yeast RNA. All this adds up to a potent nucleic acid profile (i.e., better balanced than straight chlorella) and an overall nutritional content that supports optimal uptake and assimilation of dietary nucleic acids. NOTES ON GRADE B MAPLE SYRUP, SQUEEZING LEMONS, ETC. For individuals concerned about blood sugar issues, you can simply use less maple syrup. That is, start with maybe 1–3 Tbsp of maple syrup and adjust accordingly depending on blood glucose or glycemic symptoms. In fact, one of the reasons we recommend grade B maple syrup is because it is contains more minerals than grade A maple syrup. Grade B maple syrup not only is visibly darker and richer than grade A, but also due to its higher nutrient content produces fewer glycemic effects. This is especially true when it’s combined with Rejuvenate!™ superfood, which includes fiber from chia seeds, rice bran solubles, etc. Another option for improving glycemic effects is to replace maple syrup with organic blackstrap molasses. Molasses works extremely well in Rejuvenate! Lemonade. The taste is different and distinct, but typically it grows on you. For individuals who are sugar-sensitive, hypoglycemic, or tend toward low blood sugar, using molasses may be the best way to enjoy this recipe. The maple syrup in this recipe also allows you to control calorie intake. Typically, lemonade diets are reducing diets. That is, they cleanse the body, give it a break from digesting solid foods, and support weight loss. Yet, by adjusting the amount of maple syrup in the recipe, you can encourage weight loss, maintain weight, or actually increase body weight. Most people are not seeking to gain weight, but it’s something of which to be aware when using Rejuvenate! Lemonade for cleansing purposes. That is, don’t overdo maple syrup if you wish either to lose or just maintain weight. Finally, we always recommend using fresh-squeezed lemons (or limes) to make Rejuvenate! Lemonade. I own a medium-size “Orange-X” citrus press, which is highly effective at making fast work of juicing lemons and limes (or other citrus fruits). I use it most during my semi-annual Rejuvenate! Lemonade flushes. Or when there’s company or I’m making larger quantities to share with friends. For smaller amounts of lemon juice, a small hand juicer (ceramic, glass, or steel) works nicely. Or simply hand-squeeze lemons half-cut or wedged directly into your jar, glass, or pitcher. If you are traveling or otherwise unable to squeeze fresh citrus for the recipe, then you can use an organic 100% lemon or lime juice, such as Santa Cruz brand lemon juice available in glass bottles. It won’t taste as fresh, and nutrients like enzymes and vitamins will be missing or lowered. But it is viable alternative when you have no other choice. Rejuvenate! Lemonade is excellent for kidney cleansing, weight loss, hydration, increased energy, mental clarity, and more. Rejuvenate! 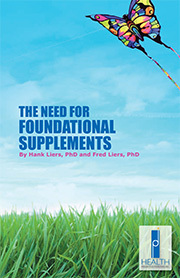 superfood provides high levels of dietary RNA and nutrient dense foods. The winning combination of dietary nucleic acids and supporting nutrients results in a superb Rejuvenate! Lemonade providing exceptional nutritional potency. This nutritional power supports a broad range of health benefits. Even kids love Rejuvenate! Lemonade. It’s a tasty way for them to get greens!! Our personal experience with Rejuvenate! Lemonade has been extremely satisfying. You will love the taste!! You will typically not be hungry (and when you are you drink more lemonade). You can lose weight rapidly (about one pound daily) for up to one or two weeks. You may be pleasantly surprised by other benefits, too. These may include exceptional clarity of mind and significantly greater energy throughout the day. Best of all, you can choose whether to try a Rejuvenate! Lemonade diet for a week or two, or just enjoy a single glass on a warm day!! However you make it for yourself, it will be delicious and satisfying!! The Master Cleanser. Stanley Burroughs. Reno, NV: Burroughs Books, rev. 2004 (19th edition). An introduction to the practice and theory of using lemonade for cleansing and health. Dr. Schulze’s 5-Day Kidney Detox. Dr. Richard Schulze. Marina Del Rey, CA: Natural Healing Publications, 2009. A practical guide to Dr. Schulze’s methods for using lemon juice, herbs, and vegetable juice for kidney detoxification. There are No Incurable Diseases: Dr. Richard Schulze’s 30-Day Intensive Cleansing and Detoxification Program. Natural Healing Publications, 1999. 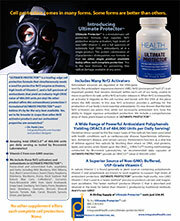 Overview of Dr. Schulze’s intensive approach to cleansing, detoxification, and natural healing.